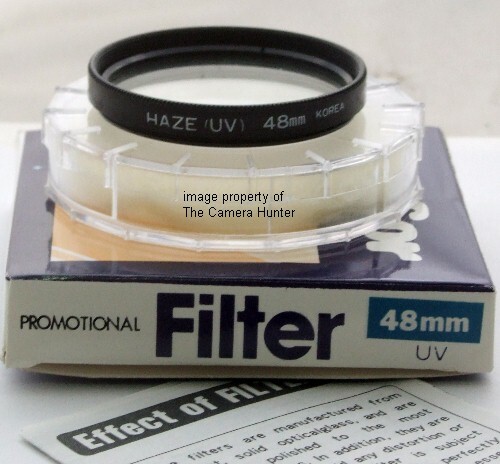 Here is a brand new rubber eye cup for many Canon film cameras. Canon was smart and made all of their camera viewfinders the same size. There are I don't-know-how-many different A, FT, T, Rebel, and ELAN series cameras, by A, FT, T, Rebel, and ELAN series I am saying that if the first letters of your camera name has these letters this is the correct eye cup for you. I really like having one on my camera. My favorite thing is that it makes the viewfinder readout easy to see even on a bright and sunny day. 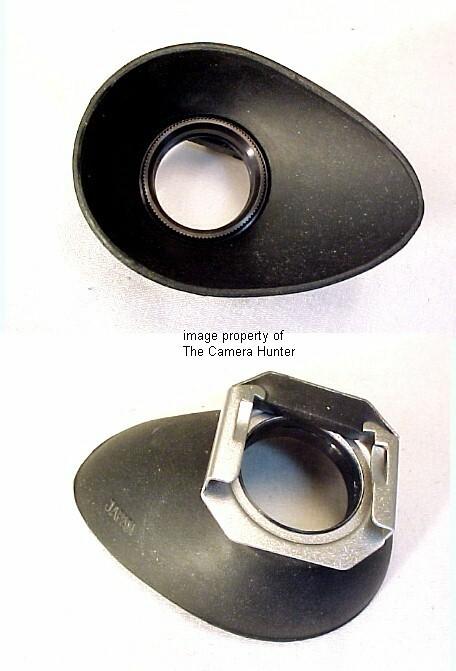 The metal piece slips onto the eyepiece of your camera. Prevents unwanted light from effecting your judgment of the image you are producing. Also prevents eyeglass lenses from getting scratched. Makes shooting more comfortable. I like this kind better than the original manufacturers because they are bigger, covering your whole eye socket. All of the original ones are either the smaller round ones or the useless flat ones. The rubber portion can be taken off or slipped around the ring to accommodate either the left or right eye. If you use a round drop in correction lens there is a space and retaining ring to hold them. 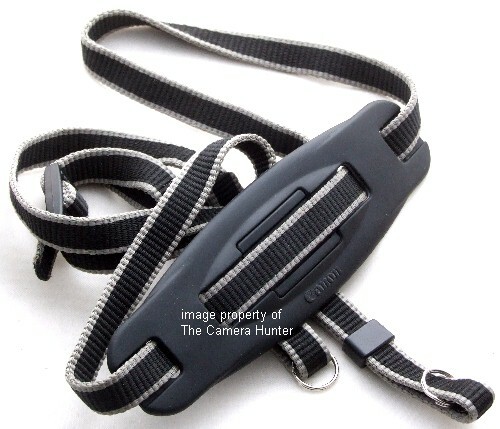 This is a previously owned narrow Canon camera strap, still in very nice condition. It comes complete with the shoulder pad and rings. I have multiples of this item so the one you receive may be slightly different then the one pictured. All of them are just like this one though and in good usable condition at a bargain price. 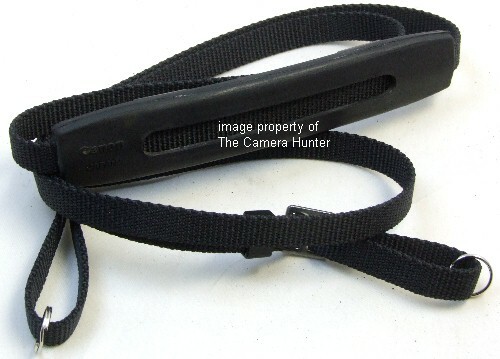 This is a previously owned narrow Canon EOS camera strap, still in very nice condition. It comes complete with the shoulder pad and rings. I have multiples of this item so the one you receive may be slightly different then the one pictured. All of them are just like this one though and in good usable condition at a bargain price. 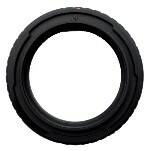 Here is a previously owned rubber eye cup for your Canon AE-1 Series camera. This will fit all of the Canon A, FT, and almost any other Canon Camera ever made, even the newest digital cameras. Canon was smart and made all of their camera viewfinders the same size. This is genuine Canon, not a cheap imitation. What's the difference? Well, the fake ones are harder rubber with little to no elasticity. They will not last, will not stay on the camera, and are uncomfortable. I really like having one on my camera. My favorite thing is that it makes the viewfinder readout easy to see even on a bright and sunny day. Prevents unwanted light from effecting your judgment of the image you are producing. Also prevents eyeglass lenses from getting scratched. Makes shooting more comfortable.